On the way to the cottage you begin to see the familiar brilliant white driveways paved with crushed shells. The same white shells that sit collected on the cottage shelves, souvenirs of your walks on the beach. At the cottage the white shells of the drive crunch under your feet and the cool green scents of the herb garden welcome you home. 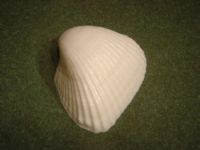 This elegant white shell fits perfectly in your hand. Cool basil is underlined with citrus and green notes. The result is a fantastically clean, fresh fragrance. 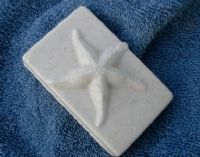 This beautifully detailed starfish lies over a sandy rectangular base; the entire soap is made of our popular oatmeal scrubby. It is fragranced with the mild and soothing Oatmeal, Milk and Honey fragrance and filled with real oatmeal. 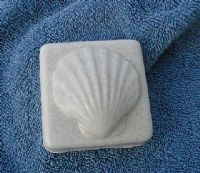 This elegant scallop shell is perched on a sandy square base; the entire soap is made of our popular oatmeal scrubby. It is fragranced with the mild and soothing Oatmeal, Milk and Honey fragrance and filled with real oatmeal. 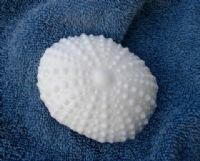 This incredibly detailed sea urchin is a companion to ever popular basil scented clam shell. This soap is also ultra white and lightly scented with the same fresh herbal fragrance.